Office 365 now connected to Slack and Microsoft Teams! We're happy to introduce you our latest connector: Office 365 Mail. Connect your Office 365 account (also known as Exchange) to Slack or to Microsoft Teams to manage your emails from there. 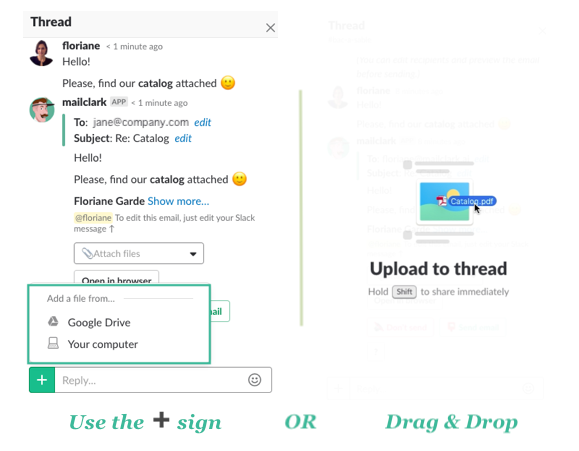 When typing an email in a Slack thread, you can now upload any file from your computer: Just click the Plus icon (➕) or simply Drag and Drop your file in the thread. When writing an email in Slack, you can now preview it directly from Slack, without having to open the message in your browser! You can now choose to receive Mentions only or DMs only when connecting a Twitter account to Slack. By default, you receive both, but if you don't want them all, or to sort them into dedicated channels (i.e #twitter-mentions and #twitter-dm), use the filter option in your settings page. We've increased the maximum number of characters displayed in the messages posted by MailClark, so you can now fully read most of your emails directly from the channel. Learn more about size limits in Slack messages. Tired to click buttons before sending an email? Add the emoji 📮 :postbox: at the beginning or the end of your message and it will be sent out automatically. 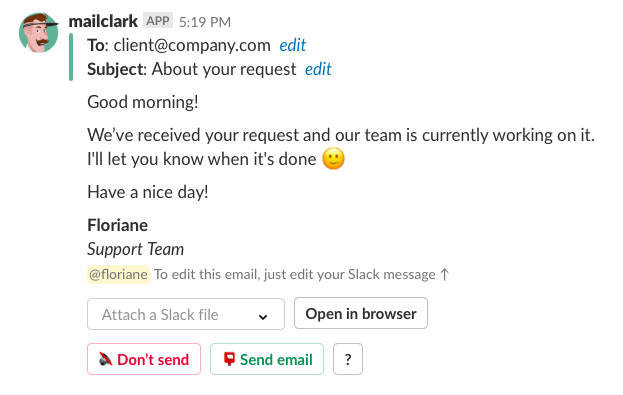 You can now send a tweet from Slack, and it no longer needs to start with a mention to someone! Just type @mailclark tweet and wait for MailClark's instructions before writing your tweet. The Facebook ‘Bot Pause’ is over! We're happy to annouce that MailClark users can connect a Facebook Page to Slack again! Just type help in a Slack DM to MailClark, click "connect services" and follow the instructions. If you need support, contact our team, we'll be happy to help. MailClark now allows you to upload files from your computer to attach them to your email. You can do so from the message posted by MailClark before sending the email or directly from the email preview. You can now automatically saves incoming emails’ attachments to your Slack workspace instead of MailClark servers. To activate/deactivate this option, go to your Workspace settings. Surely MailClark will start publishing changelogs very soon.